We were going to post our recap yesterday -- but we were still recooperating from the long day Saturday and all of the fun from the 2012 All In Team Foundation Ladies Clinic. 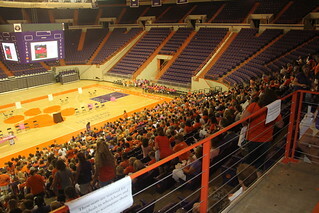 The Ladies Clinic had over 1000 women attending according to Dabo. The day was jam packed with great activities and fun - from the 'Wife Swap' game, to Elvis, to 'Dancing with the Football Stars' - I think every lady there had a fabulous time. Fellow Clemson Girl and Governor Nikki Haley attended! And Clemson student Ali Rogers, the new Miss South Carolina, was also there to participate. She is definitely a contender for Miss America in January of next year -- and we loooove her dress. 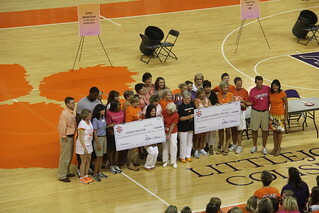 And of course, the main reason we were all there was to raise money for breast cancer research - over $26,000 was raised! The lady in the red shirt next to Kathleen is a 94 year old breast cancer survivor - talk about inspiration! This year we had our very own table set up... some of you may not have found us since we were ALL the way on the end of the shopping section, and with limited 'shopping' time, we missed a lot of you. 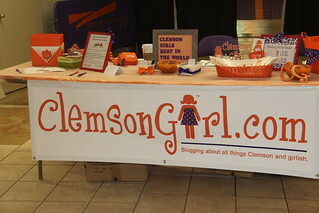 But for those of you who ventured to the end of the vendor carousel, it was so nice to meet you and we even saw our Clemson Girl t-shirts on a few of you. :) One girl told us she read about the Ladies Clinic on our blog and that's why she went - very cool! We loved seeing the Clemson gameday inspired outfits - painted Toms shoes, cute new Clemson tees, homemade Clesmon belts...and how cute are these Tiger stripe inspired nails? 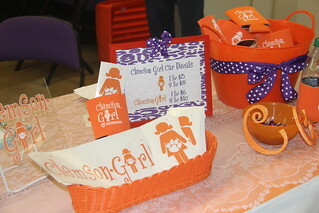 We were selling our new Clemson Girl swag...which will soon be available to purchase online (details coming soon). 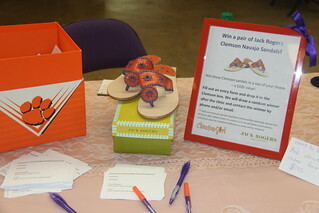 We also gave away a pair of these very POPULAR Clemson Jack Rogers Navajo sandals. 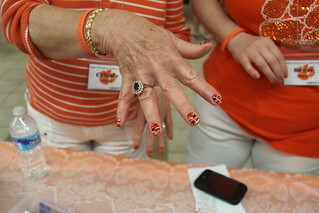 Did you attend the Ladies Clinic this year? What was your favorite part of the day? This event is always a great coming together of female Clemson fans -- it's for a great cause and it always gets everyone super excited for the upcoming football season. Can you believe it's only 39 days away until our first game?!? Whoo hoo! Thank you for the magnets! It was great stopping by your booth! Loved seeing the Jack Rogers in person, too...makes me want them more, now!! !